It was the kind of muggy June day where anyone who dared to step outside was choked by humidity and swarmed by gnats. But just like every other Saturday, David Hopkinson hit the pavement. 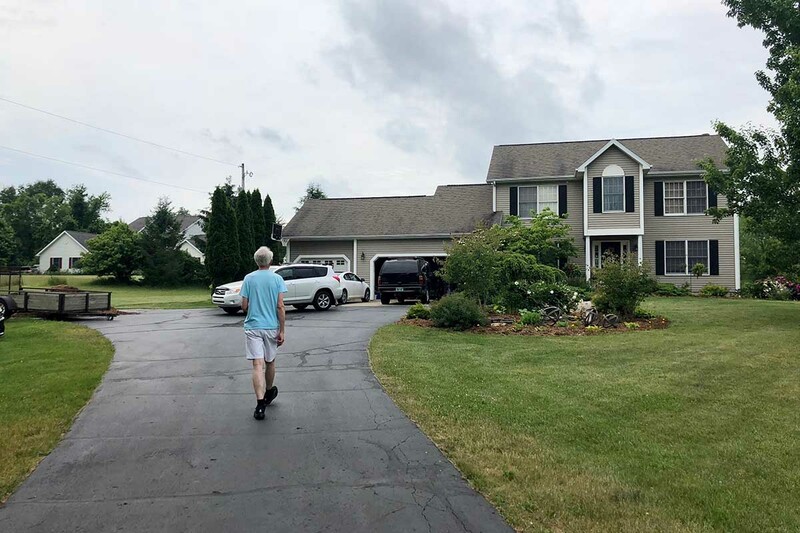 The East Lansing semi-retired accountant and a handful of other volunteers fanned out on a quiet suburban street, where they’d spend the next six hours knocking on doors to spread the word about a ballot initiative that would change the way Michigan draws voting district lines. Hopkinson dives in, explaining how in Michigan legislators from the majority party determine voting districts every 10 years. His group wants to take that power away from politicians and give it to a 13-person commission of Republicans, Democrats and Independents, which would draw maps with input from the public as well as experts like computer programmers. Hopkinson, a math-minded man with a professorial tone, might take it slower than other canvassers, but it’s hard to thoroughly explain the nuances of redistricting reform quickly. At one home, he offers a “thumbnail sketch” of how commission members would be chosen, how the maps would be drawn and vetted and how they’d eventually be voted on. It takes nearly three full minutes. It’s a sentiment echoed by more than one person Hopkinson spoke with that Saturday. It’s also the foundation of a legal argument that may pull the proposal off the ballot before people can vote on it. An opposition group funded largely by the Michigan Chamber of Commerce is arguing (along with Republican Attorney General Bill Schuette) that the proposal tries to change too many things about the state constitution at once to legally be eligible for the ballot. Instead, they argue, it would require a constitutional convention to make the change. The case is now before a Republican-dominated state Supreme Court, which heard oral arguments last week. Voters Not Politicians’ legal team counters that while the proposal is long — it is a sea of text spanning eight pages — it is narrowly focused on redistricting and thus appropriate for the ballot. Katie Fahey, the executive director of Voters Not Politicians explains how the proposed redistricting committee will work, if it makes it to the ballot and is passed by voters. A representative from the Secretary of State’s office has asked the court to issue a decision before the Aug. 7 primary and insiders expect it will come before the end of July, but the court has not said when it will decide. Even if the ballot proposal survives the court, volunteers will still face competition for votes this fall as other efforts pop up to oppose it. Last year, Hopkinson and thousands of other volunteers collected more than 400,000 signatures in less than six months to get the petition on the ballot, significantly more than the state requires. Political consultants estimate it usually costs around $1 million to get a proposal in front of voters, with much of that spent on paying petitioners to gather signatures. Voters Not Politicians organizers say they didn’t have to spend on a dime on petitioners and are instead buoyed by volunteer workers. They now say they have around 10,000 volunteers from all over the state. As of late July, the Voters Not Politicians ballot committee had more than 16,000 donations from individuals from almost every county in the state. The high number of individual donors stands in stark contrast with other ballot committees. By comparison, the ballot effort with the second-highest amount of individual donors — the one to legalize recreational marijuana — received 800 individual donations. The state’s leading Democrats largely support the redistricting proposal and leading Republicans largely oppose it, though Voters Not Politicians maintains it is nonpartisan. It touts former Republican state representative Joe Schwarz as one of its board members and Hopkinson said he works with Democrats, Republicans and Libertarians who are now active canvassers. Hopkinson tells Bridge that he identifies as an Independent because he has voted for both Republicans and Democrats. Several board members have donated to Democratic candidates in the past, a point raised by Republican critics of the ballot measure. Hopkinson said he has talked to thousands of people about the proposal over the last year and around two-thirds of those indicated they support it. Hopkinson spoke with a half dozen people that Saturday, walking from house to house through a sleepy subdivision, along a highway with speeding cars and down meandering rural driveways. According to data from the Michigan Secretary of State, the precinct he canvassed is politically moderate — it voted Democratic for president and Republican for governor over the last decade. Half of the stops had enthusiastic supporters and half were skeptical or undecided. None were vehemently opposed. Like the organizers leading his group, Hopkinson didn’t shy away from the proposal’s complexity when talking with skeptics. “One of the things I believe, hopefully not entirely naively, is if you give people enough information they can make good decisions,” he said. Late in the afternoon, Hopkinson returned to an organizer’s house nearby. As others returned to drop off their forms documenting the pulse of potential voters, they shared with Bridge their path to volunteering. Some volunteers give a few hours here and there; some work upwards of 20 hours a week. All echoed Hopkinson’s frustration with a political system they say they believe leaves some voices unheard. “It has lots of potential to solve lots of problem because it’s so fundamental and so essential what we’re trying to fix,” Hopkinson said, adding that when people believe their vote doesn’t count they devolve into cynicism about their government. So if we're against politicians drawing lines, why have 4 of each identified handpicked Republicans and Democrats, along with some folks who just refuse to admit their affiliation? Why not draw 9 random drivers license holders who know nothing but how to read a map, show them the county lines, city boundaries etc. with the allowed margin of difference, put them up for a week in a hotel pay them a $1000 each and get it done? One gets the sense that it isn't that it isn't the fact that gerrymandering exists that is the problem, it's how it's done and who it favors that is the issue. Specifically not politicians (not allowed on the commission), voters with a particular voting history. Not hand-picked, selected at random from a pool who volunteered, went through the full application process. Not just the commission members, they can consult with people with expertise in the areas of programming, map making, etc. and then get public input at each step through town hall meetings. The people are interested in solving this problem and the people will have a lot of say in this process. David, Surveys have shown the typical voter can't name their two US Senators and US Rep. let alone their Michigan State Rep and Senator. No one should buy the narrative of pent up demand for this type of reform. Just isn't so and it is just being pushed by out of power political interests to the public, as a means to put it to stick one's finger in the eye of in-power politicians. (A popular pastime, like term limits, part time Leg., pay cuts etc etc.) If you are honest I'm sure you'd admit this is why and where your volunteers and financing are/is coming from. If this was just about drawing simple unbiased lines on a map (there are already a ton of them available to use) so what's purpose of having the commission considering member's party affiliation, non-affiliation (laughable liars!) and all the consultants and experts to create even more? Dis/un-interested parties drawing the lines on the existing boundaries and let the chips fall and you'd be believable. It seems very conceivable that what is advertised is not the objective and we're just trading politicians for different party operatives. This is what democracy looks like!!! Glad to have signed and supported this critical effort! Let's end gerrymandering here in michigan ! If this ballot proposal is not approved for the Nov. election, our democracy is in serious jeopardy. This is a ludicrous claim, 'gerrymandering' has been a practice in American elections for over 200 years and by all accounts America has prospered and expanded the liberty to all and it is the longest surviving government in the world. The reality is that both Parties have used 'gerrymandering' and for the claims about protecting their power both Parties have lost power in spite of using 'gerrymandering'. As best I can tell there has been an ebb and flow of Party control through out Michigan's history, best shown by how the state wide offices have change Party, so voters [in the confines of the voting booth] vote their will not that of a particular Party. At best it is one more way to fritter away taxpayer dollars to feed the ego over current political choices. All districts need to be rectangular (except for the lake shore of course) for a start.